Fig. 1. Diffuse erythema and scaling present all over the body. 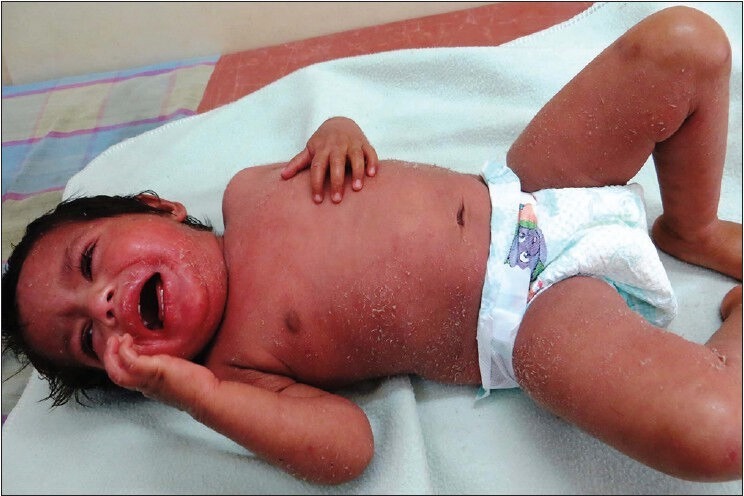 "A 2-year-old female child born at term, of second degree consanguineous marriage was referred to pediatric dermatology for evaluation of generalized, pruritic, scaly lesions from 1 month of age. The child had recurrent respiratory and skin infections from infancy. No history of collodion membrane at birth. She had delayed developmental milestones and growth retardation. She was the 7th child to her parents. First four siblings had died, 1st child died in utero at 8 months, 2nd and 3rd child died at 1 month and 11 days after birth but the cause of death was unknown. There were no records available. 4th child died at 6 months of age due to similar skin symptoms. Among the other two living siblings, 6th child aged 4 years had similar skin symptoms, which improved spontaneously. On physical examination, height and weight was below 3rd percentile. Cutaneous examination showed diffuse erythema and fine to thick adherent scaling all over the body including scalp, palms and soles [Figure 1]. Scalp hair, eyebrows, and eyelashes were sparse, rough and brittle. Systemic examination was normal. Investigations revealed peripheral eosinophilia and increased serum immunoglobulin E (IgE) levels (1276 IU/ml). Skin biopsy showed acanthosis, mild spongiosis, focal lymphocytic exocytosis in the epidermis, regular elongation of rete edges, moderate parakeratosis and supra papillary thinning. Dermis showed lymphocytic infiltrate with occasional eosinophilis. Light microscopy of hair shaft from scalp and eyebrows showed pili torti." Source: Srinivas SM et al. (2013) Netherton Syndrome with Pili Torti. Int J Trichology 5(4):225-226. Full text on PubMed.